We offer a complete Aga electric conversion service to bring your Aga up to the 21st century. With a range of different conversion methods on the market, at Yorkshire Home Heating, we use only the best technology to safely and reliably convert your Aga from its current fuel supply, be that gas, oil or solid fuel to a modern, cost effective electric solution. If your beloved Aga runs on oil, gas, or solid fuel, then we can help you. Year on year we see the percentage of Aga sales and conversions increase towards electric technology, and for good reason. 1. The running cost of an electric Aga is drastically lower than those ran on other fuel. Between the fuel savings, and the fact that there is zero requirement for servicing, most of our customers make their money back on the conversion within 2 years. 2. Due to much better insulation and efficiency, the temperature in your oven is maintained at almost 100%, and won’t decrease over time. 4.There are no naked flames, which means electric is safer with no risk of fires. 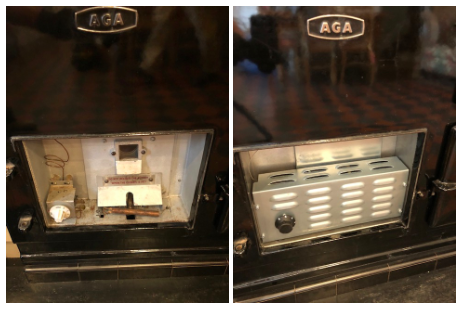 As one of the country’s leading independent Aga specialists, we have tried and tested lots of different conversion methods. The one we use is absolutely the best on the market. The 13 amp conversion kit we use ensures a seamless, cost-effective conversion from other fuel types, bringing you immediate benefits. We’re proud to be innovating and providing the best possible service to our customers. One thing that makes us different is how we coat the internal casting and steel parts of the cooker with a ceramic wool, improving heat retention and reducing running costs. That means that even if you’ve already had an electric conversion done by another company, we can still improve the efficiency and cost savings even further, so give us a call today. Having now completed hundreds of Aga conversions over many years, our team are experts in the process and are more than happy to help answer any questions you have to ensure an electric conversion is right for you and your kitchen! Call the office today on 01642 593 605 to talk to an expert.